There are a countless number of games for smartphones. But every so often, a game comes along that really makes you think. It’s not just about being smart. It’s about finding unconventional solutions. This is what I found when I started playing Tricky Test 2. 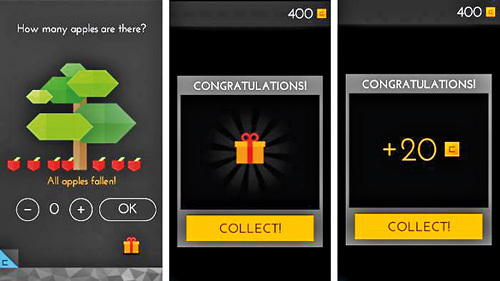 Before you start playing Tricky Test 2, we would recommend you try and get as many coins as possible. These are obtainable by watching ads and also liking Tricky Test 2’s Facebook page and following the developer (Orangenose Studio) on Twitter. Why should you concern yourself with coins? Well, we’ll get to that in a bit. The primary premise behind Tricky Test 2 is to answer questions. There are a total of 111 questions to be answered. As you progress in the game, the questions will increase in terms of difficulty. We’re not talking saying that you’ll be asked to solve complex mathematical equations or find a solution to make perpetual energy possible. Rather, the questions themselves require you to think a lot before answering. If you didn’t realize by now, each of the 111 questions in Tricky Test 2 employ a different method to be solved. The app also makes use of your device’s entire display and motion sensors, making answers a lot more interactive. This gives you the ability to rotate objects, shake objects and even interact with onscreen objects as well. Speaking of clues, remember those coins that we collected? Well, this is where they come in handy. If you find a question too difficult to answer, you can choose to get a clue. Each clue will cost you a certain number of coins. In addition, you can also skip ahead and reveal the entire solution as well. This, for obvious reasons, takes a lot more coins. So be sure that you’re absolutely positive that you want to reveal an answer before you do. In case you run out of lives, you can also watch a video to get your life back to 100%, in this case, 5 hearts. In case you’re running low on coins, there’s a small notification at the bottom of the screen on each question. The notifications are usually about watching ad videos which give you 20 coins in return. It’s a bit annoying to sit through the videos but then again, if you’re paying coins to reveal answers, you’re losing the point of Tricky Test 2 as well. My first impressions of playing Tricky Test 2 and answering questions were that the answers were completely unorthodox. For example, one of the questions I was asked was to tap all the mice who appear on screen. So as the challenge said, I tapped all the mice. Despite that, I didn’t proceed to the next round. It was then that I realized that I had to actually click the icon that showed the mouse as that was the last mouse. Another question had a bottle of ketchup on screen. Above the bottle of ketchup was a caption saying “Can I have some ketchup?”. 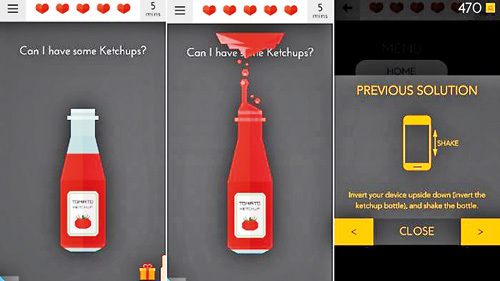 The solution was to turn my phone upside down and shake it, just like I would a regular bottle of ketchup. Think you’re good with numbers? Well, I thought I was. Another question was to sort a bunch of text boxes according to the values in them. The values were 23, 212, -219, 3104 and -1222. Once correctly sorted, I realized that the time I have remaining to answer the question was part of the answer itself. Clearly the developers had put a fair amount of thought into developing both the questions and answers for Tricky Test 2. For a person who’s bad at numbers, I did pretty well. 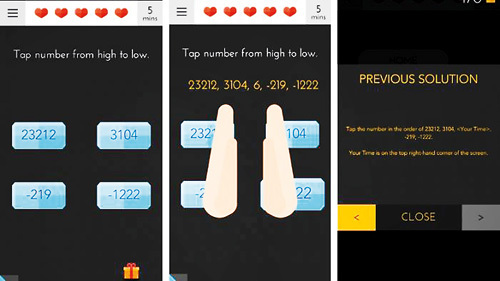 You can also challenge your friends to play Tricky Test 2. This is done by the “Challenge Friend” option. The questions are the same 111 questions that you have access to. The only catch is that the questions available for the second player are ones that you have already unlocked. So the more you answer from the original 111, those would also be made available for the second player. You can also link your Facebook account to Tricky Test 2 to save your current progress. This was what my colleague Lahiru forgot to do, resulting in him having to start from scratch. The login to Facebook also gives you a number of coins as well. I’ve been playing around with Tricky Test 2(and spending a fair share of coins on hints) for about 2-3 days now. My experience with it has been quite enjoyable. The questions seem simple at first but are quite tricky, as the name suggests. 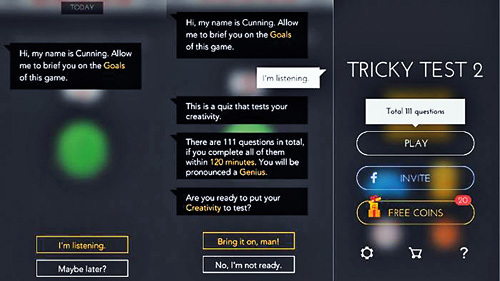 If you’re in the mood to rack your brain and get a good chuckle in the process, then Tricky Test 2 is definitely something you should have. It’s available for both Android and iOS. 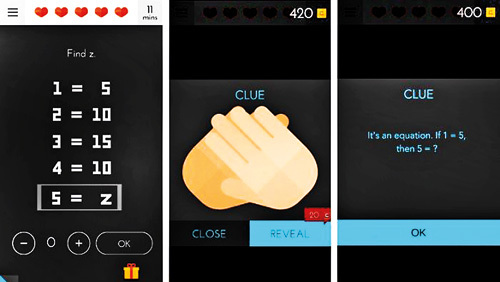 A hundred and eleven questions mean that you’ll be at your phone for quite a while. You’ll also want to keep an eye on your phone battery. Not to mention, you might also have to explain to your boss why you’re shaking your phone trying to get ketchup out of it.